Welcome to the Premiumbuys.co.uk website terms and conditions. These terms and conditions apply to your access to the Premiumbuys.co.uk website ("Website"). Please read these terms and conditions carefully before accessing and/or ordering any goods from our Website. If you access the Website, and/or place an order for goods, you agree to be bound by these terms and conditions. If you do not agree with the terms and conditions please do not use our Website. Working Day/Days refers to any day other than a Saturday, Sunday or English public holiday. 2.1 These Conditions (as updated by us from time to time) shall set out the entire agreement and apply to all Contracts between us for the sale of Goods. These Conditions apply to all purchases you make from us at any time, whether you place your order through this website or by any other means set out in our catalogue. 2.3 We reserve the right to withdraw any offer or special promotions displayed on the website that in the opinion of SMD TRADING LIMITED is being abused. However, in the event that you have already placed an order that we have accepted we will provide you with a full refund for any money received. 3.1 Your order represents an offer to purchase the Goods which is accepted by us when we dispatch the Goods to you. All orders are subject to availability and on a first-come first-served basis as unfortunately we are unable to reserve Goods. 3.3 We operate on most Working Days during the office hours of 09.30-17.00 GMT. We will endeavour to handle received Orders and communications within five Working Days of receipt. Orders and communications received outside these office hours will be handled as if they were received on the next Working Day. If it is possible, orders and communications may be handled outside of office hours. 4.2 While we try to ensure that all prices in our adverts are accurate, errors may occur. If we discover an error in the price of goods you have ordered, we will inform you as soon as possible and give you the option of re-confirming the order at the correct price or cancelling it. If we are unable to contact you, we will treat the order as cancelled. If you have already paid for the goods and the order is subsequently cancelled, you will receive a full refund. 4.4 The price is inclusive of any applicable value added tax or other sales tax (at the rate form time to time in force) and any packaging or delivery costs for which you shall be liable will be confirmed after your order has been placed. 5.2 If you fail to make any payment on the due date then we reserve the right to: (a) cancel the Contract or suspend further deliveries to you; (b) charge you a reasonable amount of interest (as well after as before any judgment) on the amount unpaid, form the date the amount was due until payment is made in full, accruing pro rata on a daily basis. 5.3 In the event that a cheque or credit card payment is dishonoured by your bank or credit card provider, they (being your bank, credit card provider or our debt collection company "Transax" or "Certegy Ltd") may charge a fee. Where we incur any fee or liability as a result of a dishonoured payment, you will be liable to reimburse us in full for the amount we have incurred. 5.4 Validation Checks. All credit and charge card holders are subject to validation checks and authorisation by the card issuer. If the issuer of your payment card refuses to authorise payment to us, we will not be liable for any delay or non-delivery. In addition, in the interests of preventing fraudulent use of credit, debit and charge cards, We will validate the names, addresses and other information supplied during the order process against commercially available records (e.g Electoral Roll data, Credit Reference Services). A third party may also be instructed to complete these checks. By ordering from this website you consent to such checks being made. We may need to contact you by letter, telephone or email to verify details before we are able to process and dispatch your order or we may be unable to accept your order. Any information given may be disclosed to a registered Credit Reference Agency which may keep a record of the information. All information provided will be treated in accordance with the Data Protection Act 1998. These measures are taken as extra protection for you, to ensure your online shopping experience with us is as safe and secure as possible. 6.2 We aim to provide you with a reasonable date on which the Goods will be ready for delivery. Where we become aware that the date for collection of delivery may be delayed, we shall notify you as soon as possible and aim to provide you with a revised date. We shall not be liable for any loss you incur, whether financial or otherwise, resulting directly or indirectly from our delay or failure to meet the date where the delay is caused by reasons outside of our control. 6.5 We will make best endeavour to despatch Orders to the Buyer within 1-5 Working Days of receipt, but does not guarantee this. 6.6 The Buyer must allow a minimum of 5 Working Days for despatch and delivery of an Order if the delivery address is within the UK, or a minimum of 10 Working Days for despatch and delivery of an Order if the delivery address is outside the UK. 6.7 The Buyer must notify Premiumbuys of any damage, errors or deficiencies within 48 hours of receipt of the Order. 6.8 The loss of any order due to incorrect information supplied by the Buyer is the responsibility of the Buyer. We will not be liable for any losses incurred as a result of errors on the Buyer's part. 6.9 You may be subject to customs requirements and duties when ordering Goods for delivery outside the UK (only applies when we ship outside the UK). Import requirements differ from country to country so you should contact your local customs office for further information of any relevant requirements and charges. We have no control over these charges and cannot predict what they may be. Any such charges must be borne by you and you are responsible for complying with all laws and regulations of the country in which you are importing the Goods. Please be aware that cross-border deliveries may be subject to opening and inspection by customs authorities and we are not responsible for delayed delivery times due to packages being inspected by customs. 6.10 We do not offer a collections service. 7.3 Until such time as the as the Goods are paid for in full, you shall be responsible for taking reasonable care of the Goods). Where you fail to pay for the Goods in accordance with these Conditions, we shall be entitled, at any time, to require you to deliver up the Goods to us and, if you fail to do so seek a court order to permit us to enter upon any premises where the Goods are stored and repossess the Goods. 8.3 Our liability in respect of death or personal injury caused by our negligence and any other liability which it is illegal to exclude or attempt to exclude under applicable law shall be unlimited. For all other loss or damage which you may suffer or incur in connection with the supply of Goods under this Contract, our liability shall be limited to that caused by a natural and reasonably foreseeable consequence for which we are at fault or negligent. 9.6 The Contract and these Conditions shall be governed by the laws of England, and you agree to submit to the non-exclusive jurisdiction of the English courts. 9.8 The copyright in all photographs, images and descriptions contained on this site/catalogue are owned by Premiumbuys, and may not be reproduced without the express consent of Premiumbuys. 9.9 Images: Due to different monitor settings and different monitor colour restrictions, the actual shade may vary slightly from the colour on your screen. We try our best to keep this to a minimum but this can sometimes occur. 9.10 All dealings between us in connection with these Conditions and each Contract shall be carried on in the English language. 10.1 If, for any reason you are unhappy with the Goods, you have the right to cancel your order at any time within seven working days from the day after the day on which the Goods were received. 10.2 Should the Buyer wish to return Goods, they may do so provided that the Buyer contacts the company within 5 Working Days days of receipt of the Goods to obtain a Goods Return Authorisation. Goods will not be accepted for return without prior authorisation. 10.3 Return of unwanted Goods is under condition that the Goods are unopened with any manufacturer seals and packaging intact (i.e. in a resaleable condition), and that all labels are also intact. Unwanted Goods that are returned with labels not attached/no labels, or are otherwise incomplete or unfit for sale, will be rejected and returned to the Buyer, which will incur further return postage charges to the Buyer. We will not pay return shipping costs, and are not responsible for returned Goods lost in transit. 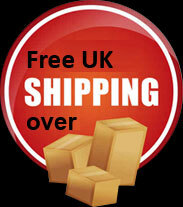 Buyers are advised to send any returns via tracked and insured mail. The original paperwork must be included in the return parcel otherwise we will not be able to process the return. 10.4 For hygiene reasons, all underwear and swimwear is non returnable. 10.5 We aim to process returns in 7 days, but please allow up to 14 days for your refund. We currently do not exchange goods, we will issue a refund for the original goods and then the buyer can purchase the required item. If you request a refund then the amount paid will go back onto your original payment. 11.2 Promotional codes are not valid in conjunction with any other offer. 11.4 The promotional codes can be withdrawn by us at anytime. 11.5 All offers to which the promotional code relates shall only be available on UK mainland orders (excluding Postage and Packaging costs at the current rate). 11.6 Promotion codes cannot be used after the expiration date. 11.7 We cannot issue refunds for promotion codes not used at the point of order, please check your order thoroughly before placing to avoid disappointment. 11.8 Discounts are applied proportionally to goods hence any returns or refunds on products will be on the proportional price and not the full price if a discount was applied. 12.1 All monetary transactions for Orders placed on the Website are processed by trusted third-party payment handlers - currently PayPal. These companies offer a safe, secure payment environment independent of SMD TRADING LIMITED. 12.2 We do not have access to the Buyer's financial details in any form. Buyers should be aware that using the online payment methods offered construes acceptance of the Terms and Conditions of the payment handler. The Buyer should review and understand the terms and conditions of the chosen payment handler before placing an Order. 13 If you have made a purchase from our site, we may occasionally update you on our latest products, news and special offers via e-mail. The same applies if you have signed up for newsletters and exclusive offers by registering your email address at our site. All our customers have the option to opt-out of receiving marketing communications from us. If you do not wish to continue to receive marketing from us you can opt-out by contacting us or click on the "unsubscribe" link in any email communications which we might send you. 14 We reserve the right to amend the Terms and Conditions at any time.